Track energy levels. By monitoring how their energy ebbs and flows throughout the day, you can create a schedule that they can stick to. Activities such as walking around the corner each afternoon can boost physical and mental health, as well as enjoyment. Bingo. A fun opportunity to work with numbers, letters and patterns, Bingo helps stimulate the brain through social interaction, spatial awareness and cognitive skills. Card games. Card games are the simplest form of memory games. Ones that don’t require tough decision-making, such as Go Fish or Old Maid, are an easy and fun way to exercise the mind. Puzzles. Those with Alzheimer’s are able to tinker with the pieces and play with patterns, challenging the mind. Arts and crafts. Uncomplicated designs allow them to express themselves and use their creativity while using logic skills to complete the project. Listening to or playing musical instruments. Music can trigger old memories, stimulating the hippocampus. If your loved one used to play an instrument, they may be able to pick it right back up with ease, as the act of playing it is stored in the procedural memory, or your unconscious memory. Stories or nursery rhymes. Reading stories or having them recite stories to you engages them in the task at hand. The language processing area of the brain is stimulated and they are also fulfilling their need for social interaction and belonging. Participating in activities that stimulate the brain helps to decrease irritability and anxiety, build connections with people, arouse memories, encourage and boost expression and increase engagement. These are a small sample of great Alzheimer’s care activities that you can do with your loved one. 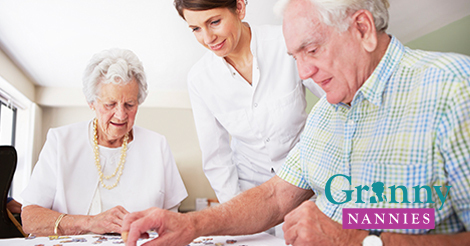 For more specialized Alzheimer’s care, the Certified Nursing Assistants and Home Health Aides at Granny NANNIES are pre-trained to be there when and how you need them. Granny NANNIES is dedicated to treating clients with the highest level of respect and dignity, maintaining our standard of excellence. Available 24 hours a day, seven days a week, or on an as needed basis, you can trust Granny NANNIES’ quality, trustworthy, reliable and affordable senior home healthcare services. Since 1990, Granny NANNIES has gone the extra mile. For more information, call 800-316-2669.